Sorry guys I think the last post you were emailed was missing the pictures. They didn’t upload properly. Here is a link to the same post with the pictures. I have since corrected it. Everyone else – you can just scroll past this to the previous post which is days twelve and thirteen. Woke up for 5.48am when the train was supposed to arrive as stated on my ticket. On the other train that I was on the other day they woke you up for the correct stop but this time no one was around so I asked the guard and some other English speaking tourists and they said that the train had been delayed by one hour, a very common occurrence in Thailand. So I went back to bed for another hours rest. When we arrived we were met immediately by a crowd of Thai bus and taxi drivers as normal when getting off any transport here. I followed a bus driver whom a group of other tourists were booked with. I asked them and they were all on his bus and they all had tickets already. I bought a ticket to Ko Samui (I just decided there and then which island to go to) and then had a chat to a Canadian family who were in the bunks next to me on the train. There was a mother and father and three children, they were French Canadian so were bilingual and were traveling for two months. When I said that I had just bought my ticket, the couple said when they traveled when they were younger and they just used to get up in the morning, pick a place and say, that looks nice we will go there today. Now they have children they said they had to plan the whole journey all in advance. I then had breakfast at one of the cafes next to where the bus was parked and bought some snacks for the journey. The bus was scheduled to leave at 7.30am but didn’t actually leave till about 8am I reckon. About two hours drive later we arrived at the ferry dock at a place called Donsak and then waited another 30 mins for the boat. We were given stickers in exchange for the tear-off part of our ticket, different colours marking out our destination. They called the names of the islands in order of where the boat would arrive; last to first. Ko Samui would be first so our bags were loaded last. Up until now all the transport I have taken has been used mainly by locals and a scattering of backpackers but this ferry to the islands was was 100% white backpackers, this is because the locals don’t go to the islands and if they live there then they don’t leave the islands. The ferry was a slow one (I have since learnt you can pay more and get there very quickly) and also really old. As we were loaded last there were no top deck seats left and so I sat inside. On the back of every chair was an ancient looking faded fluorescent orange life jacket. I looked out at the water during the journey and thought ‘it doesn’t look that blue’ but I have since read that the sea in this area is meant to be green and it was more green now I think about it. I arrived and walked past all the Thai’s trying to flog you a taxi and found a cafe where I had a shake and cake and used the wifi. 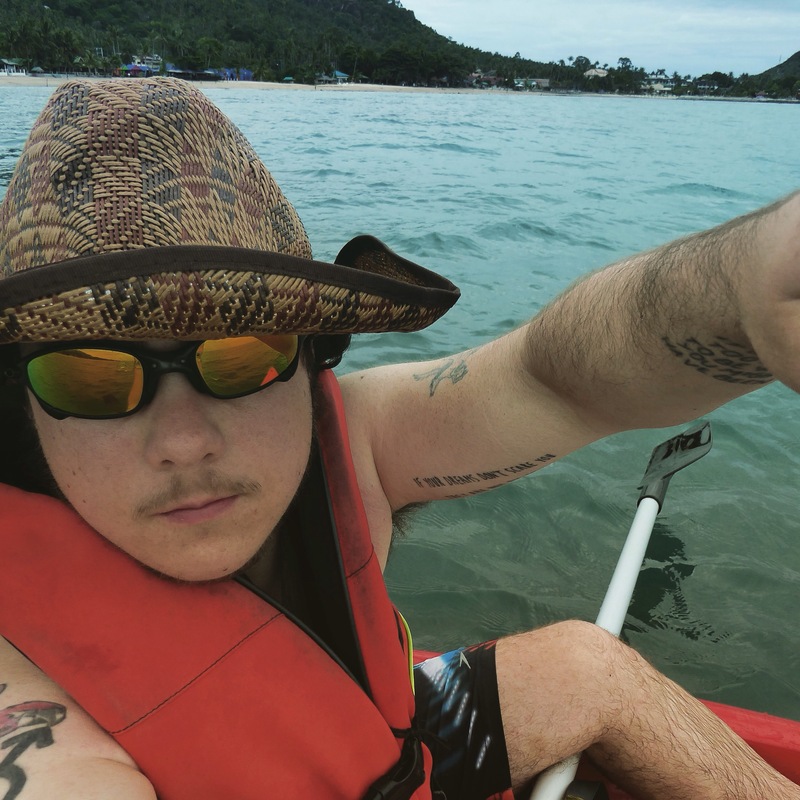 I found a decent place to stay called the Weekender Villa on trip adviser right on the beach, I went for Lamai beach as that is where my friends from the geckos trip would be for the next few days and I was possibly going to contact them. I asked at a tour office and they said a songthaew would cost me 100 baht which is cheaper than a taxi so I got one. I was the only customer but as we went towards Lamai beach it stopped and picked more people up. I have since learnt that they run a bit like a public bus, charging the same rate for each person and then just stop off in the general area. The Songthaew drove down the main road and then down the side road to Lamai beach. I pressed the button when I saw the word ‘weekender’ flash past. 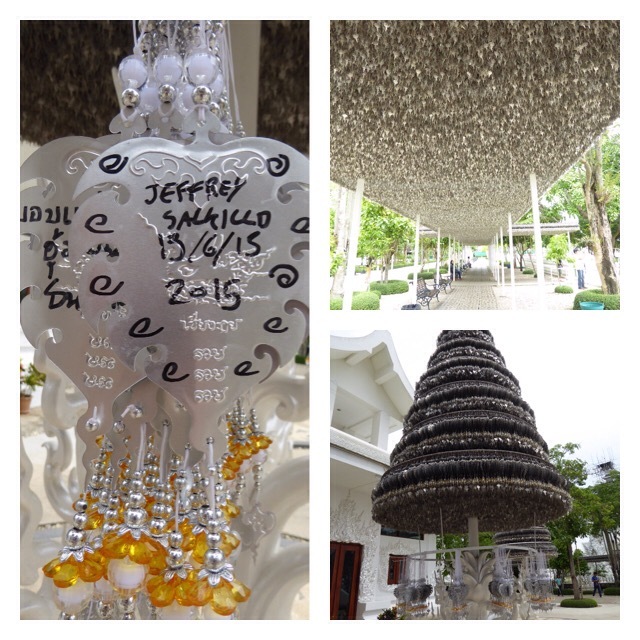 I walked into the reception but it was like 3,200 baht a night. I showed them the trip adviser page and told me that I was in the wrong place. So back out in the road I asked a taxi. It they wanted like 300 baht. I said no and the man refered me to a motorbike taxi. I was hot and tired by that time and I just wanted to get there so I paid 100 baht and the motor bike took me right to my hotel door. In the reception there was a white guy, possibly Australian from the accent, a refreshing change to trying to make myself understood to non-English speakers. I might have sounded a bit strange to him as I have started to miss conjunctions out of my sentences, it took me a while to speak properly to him. They had a small pool and I had my own air con bungalow with a slightly raised patio. After checking in I took a short walk on the beach and then out down the street to 7-11 and what did I see! A bookshop! I saw a massive sign (see pictures) advertising it with an arrow and ‘walk 50 metres’, so I walked down a sand dirt track 50 metres and there it was. An awesome second hand bookshop called Island Books and the guy there buys books back as well! It’s a shame I left some of mine in Bangkok for free in a book swap. Anyway I chatted for quite a while to the owner a British man from Liverpool and a self proclaimed ‘Scouser’. He told me, amongst many other things, that he married a Thai woman and has lived here for 25 years and only been home twice in that time. I think his wife has now died but he has never gone back to England. He talked about his Thai mother in law quite a bit but so I think he must spend quite a lot of time with his late wife’s family still. 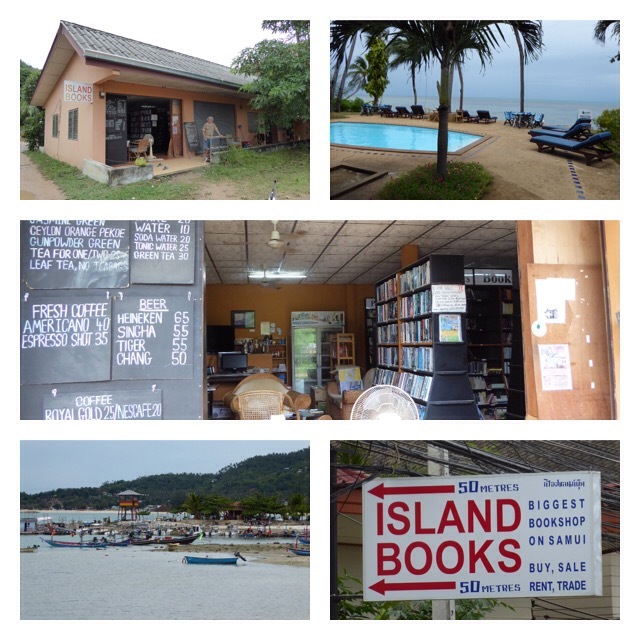 He said he doesn’t get books shipped here but buys them all off the locals and other Europeans who live on Ko Samui. The books were mainly English but he had a small room at the back with a section of books in 20 other languages! You can read pretty much his life story here in the about us section of his website. Back at my hotel I took an early night. In the morning I got up fairly early and hired a Kayak from the hotel reception. 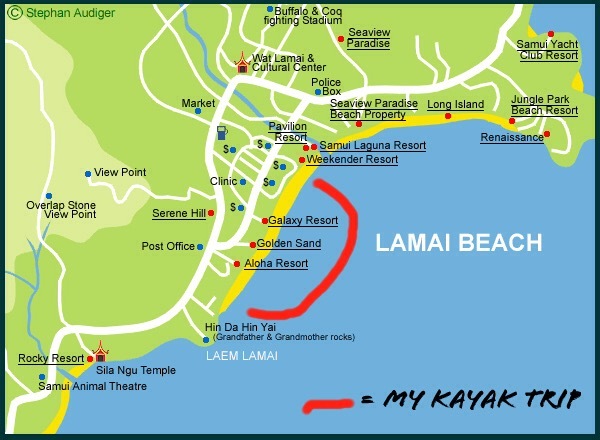 I kayaked round the whole bay at Lamai beach, see map and to the Grandfather and Grandmother rocks, ‘Hin Da Hin Yai’ in Thai, which I couldn’t get up very close to because I was in the water on the kayak. It took about an hour and a half but the return trip only took forty minutes because the tide was pulling me that way. I waded into the sea to see if I could walk to the Grandmother and Grandfather rocks but it turned out you can only get to them from the road. While I was in the sea my ‘waterproof bag’ got wet, turns out it is only rainproof not sea proof and the daft thing is I actually kinda knew this. So my phone got soaked! I also actually have a waterproof case for it but I took it out of said case only hours earlier duh! So one dead iPhone…. But I am not too upset as there was nothing important on it because I backed it up to the computer before I left home and I have my iPad, which is fine. I was planning on buying a new iPhone on returning from this trip, looks like that is a certainty now. Next up: days fourteen and fifteen. Previously: days ten and eleven. Woke up about once every hour while on the night train. Oh a few things I forgot to mention about the train in the last post; there is a full menu which you can order from and the food comes to your table hot and covered with cling film. All the beds are covered with a curtain and these are all numbered so the guard/bed making man will come round and wake you before your stop so you don’t miss it. We arrived around 8am, I’m not sure of the exact time, it is highly unlikely that the train was on time anyway :p. It was strange being back in Bangkok after the North. As we approached our station we saw lots of shack homes through the window. They all had satellite dishes on the roofs, but probably no kitchens inside (I learnt this from another traveller, who said this is one of the reasons why there are stoves and fires in the street and street food for sale). We had a prebooked taxi and they dropped us off a few doors from our hotel where we had breakfast, we also used the free WiFi and I did a survey for Geckos on James’s smartphone. Back at the Nouvo City Hotel where I stayed for the first three days in Bangkok we had two rooms for use until 12pm so we showered and changed. I got a hostel room at a place called Jades House one minute from the Nouvo City Hotel for convenience so I could hang out with my group. At about 1.30pm I joined Emma, Katie and Patricia from our group by the Nouvo City Hotel pool on the roof and then after a swim had lunch in a cafe just next to the hotel (we couldn’t be bothered to go far). In the evening we met at 7pm (after the group had the welcome meeting for the the rest of their trip, (they lost four people and gained eight so the group is now at 16). We ate dinner on Khao San Road at a totally different place to anywhere James has taken us so far, very touristy. I guess it’s partly because the next week of the trip is called something like ‘beaches and sandcastles’ and is more a party/relax trip. We decided not to go to the Sky Bar featured in the Hangover 2 movie (after a long discussion about prices), as they had to leave at 6am the next day (and it was half an hour each way) and it is 500+baht for a drink there plus an entry fee! We went to a nice bar called the ‘Blues Bar’ and listened to live blues music, sitting right on top of the musicians. My first day really on my own. I have been really lucky so far with the people I have met, both the Geckos group and Maren the German girl who I met at the airport. I am not sure where to go next, I was also not sure if there is really three months of stuff to do in Thailand, it is very touristy here now, even more so than just a couple of years ago and there is very little culture left to see, the traditional way of life has been lost in many places due to tourism. I am leaning towards also visiting the neighbouring Asian countries like Cambodia and Vietnam. As to the reference of ‘The Land of Smiles’ that everyone says Thailand is, I think that is more like a subtle reference to the not showing emotion thing that is part of Thai culture. Here you should never show anger or frustration and I think that is where the phrase has come from? I’d say one in very 10 to 15 Thai people are really helpful, so no different to if you stopped a local in the street for directions in London and Europe. I just googled this and apparently it is actually because Thailand has thirteen classifications for ‘types’ of smiles? Read this article if you are interested, I’m not sure how close to the truth this is? So I did some washing and then got a tuk tuk to the Bangkok railway station where I bought my ticket for the sleeper train to Surat Thani. This is a city but also the name of the province and the place from which you then go on to Phuket or Ko Samui, I wasn’t sure where I wanted to go yet. I’m glad I came here with Maren when she booked her train a week ago so I knew the drill. 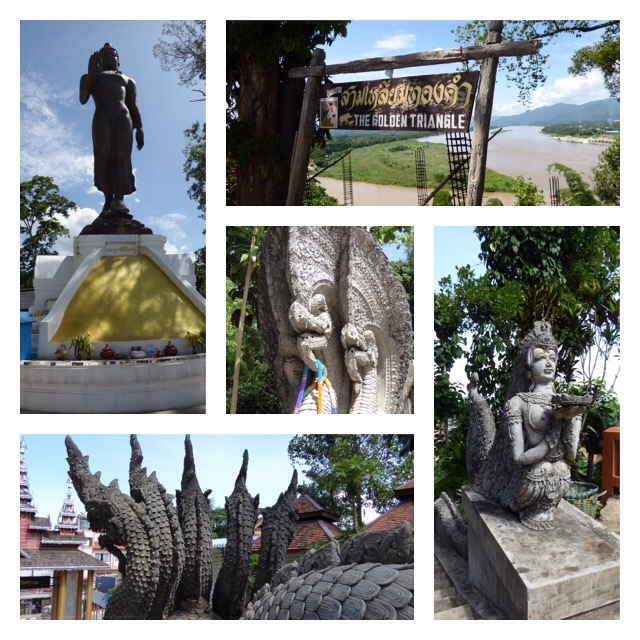 I left my bag at left luggage for 50 baht and used an Internet cafe and then I wandered of to explore. I got on a local bus and the lady asked me where I wanted to go and if was really hard to explain I just wanted to sit on there until I saw somewhere I wanted to get off. After about five minutes a Thai man came over to translate and in the end I payed 13 baht which is the price to the ‘end of the line’ on that bus. That is a crazy amount of money compared to the 100/200 baht we were paying to get around on a tuk tuk! I got off after a while and tried to ask at a 7-11 store where I would be able to find a bus timetable (I’m not sure there is such a thing here but hey). So in the end I stood by a bus stop and then a local asked me and I said to Khao San Road and they said buses 30, 32, 33, 64 or 65. So I got on bus 30 and said to Khao San road, and that cost me 5 baht! On Khao San Road I met Scott and Demi the Scottish couple from my tour! We had a chat and they told me about the Tiger Kingdom trip they did. They said the Tigers were not sedated at all. This was their last day and they were flying home tomorrow. Then I had another drink in a cafe just to use the Internet again :p.
Since it was so cheap I decided to try and get a bus back to the train station. I had another difficult time trying to get bus info out of the man in the official kiosk, he didn’t speak any English, and finally a local lady with near fluent English helped me. But she still didn’t know which bus went to the train station, she asked another lady and we decided that it was buses 35 or 47. It was 7 baht to Hua Lamphong, the place where the train station is, no bus goes directly there which seemed a bit stupid to me? So I walked a few minutes and through an underpass to the station. In fact the station itself is unofficially known as ‘Hua Lamphong Station’. 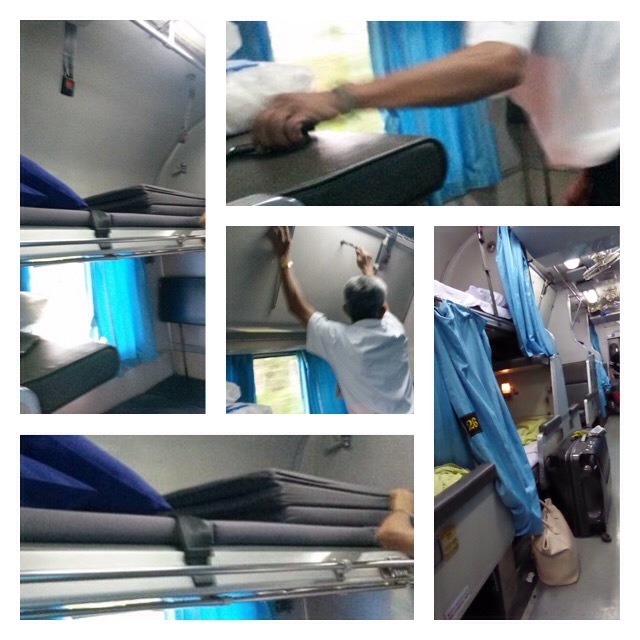 Then I got on the night train at to Surat Thani. 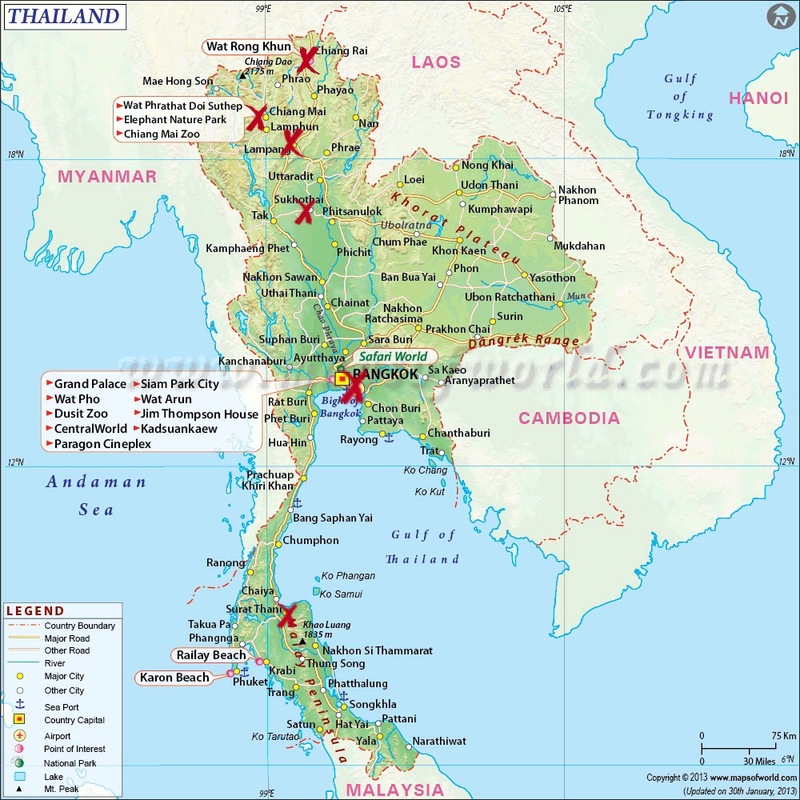 No pictures for these days really so here is a map of Thailand showing where I have been so far (x marks the spot). Surat Thani in the South is also marked so you can get an idea of where I’m going. Next up: days twelve and thirteen. Previously: days eight and nine. The next instalment is up. Up for a 9am departure. I paid for breakfast in the hotel with some of the group. 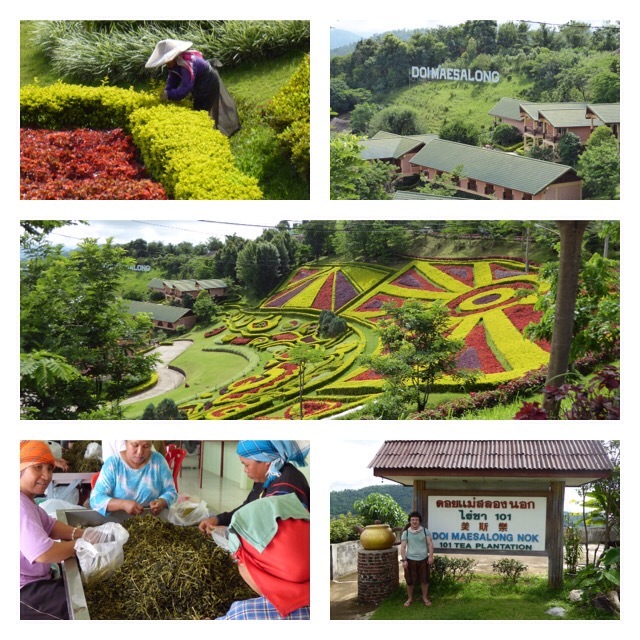 We got a Songthaew to a view over the tea plantation in Doi Mae Salong and then down to the plantation itself which is called ‘101 Tea Plantation’. They have a ‘Hollywood’ style sign on the hill and there was some lovely colourful landscaping, (see pictures). We saw where the tea was sorted by hand from the stalks. The women work 8.30am till 5pm which is very reasonable. So some facts about the tea; apparently the high grade tea is a younger leaf and it is picked by hand, then the rest is cut with a hedge cutter and this is the lower quality. The bushes are actually about seven years old but they never grow very large as they are being cut constantly. We also did tea tasting, we tried three teas, which I think are the same leaf that has been processed differently. The whole area where this tea is grown used to be used for growing poppies for the opium trade. We stopped at the shop which was a few minutes drive and some of us bought ice creams. There was a pricing dispute between the Scottish guy (Scott) and a little Thai lady. It was so confusing, even with our guide translating and in the end Scott just paid extra to make her go away. We had lunch at the Burma border and watched the traffic crossing the bridge that forms the border at this point. We had a quick walk around the market before driving off to another temple and the opium museum. In the evening we were back in Chiang Mai and we went to an awesome night food market, which was like a large rectangle surrounded by food stalls and the centre was filled with metal tables and chairs. There was a massive choice of food and I had shell on prawns and thin French fries which they seem to call ‘frieds’ on the menus here. There was free entertainment, traditional North Thailand dancing. Girls in flowery skirts and with their faces frozen into false smiles, almost like a grimace. Then there was a man playing guitar for a bit and then two Chinese girls about 12 years old came and sang a song. They were just customers of the market and introduced themselves first in Chinese and then in English. They said it was their first time leaving their home town and that they wanted to sing this song for their friends. After they sang our guide bought them some real flower necklaces and they were really pleased. Our table was directly opposite the stage so we had a good view. I tried someone’s chicken wing skewer and also our guide James’s month old egg which was black and preserved but really just tasted like egg. I had coconut ice cream for pudding and then we all went to a bar and played pool. We were leaving at 9am so I walked out to 7-11 and bought myself breakfast. When I got back to the hotel it turned out that the hotel did free toast and coffee. I didn’t really mind but I think there was a bit of missed communication there because a few others went out and bought breakfast too and were surprised it was free (we had to pay at the last place). 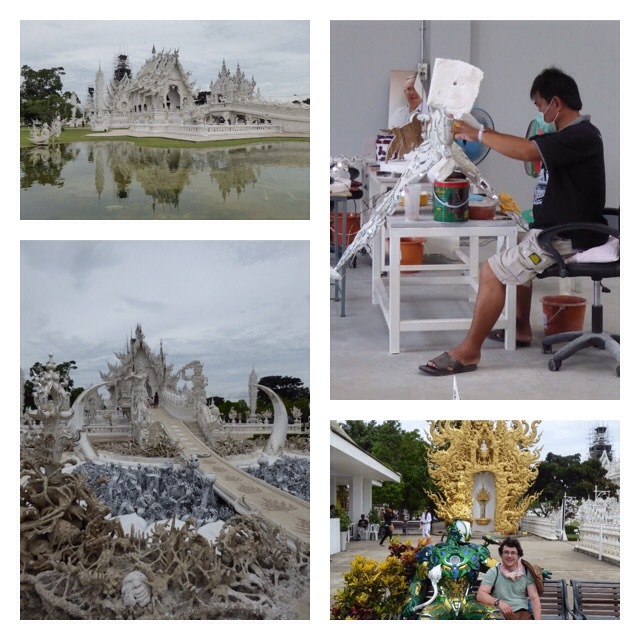 We were driven to the White Temple (Wat Rong Khun). Something I have been waiting to see since I got here. It is a modern art temple designed, made and payed for entirely by this one guy Chalermchai Kositpiat. James told us a story that he offered his wife a one off amount of money and she said 10 million baht and then he spent everything else he owned on the temple to the Buddha (40 million baht). He is now 60 and the temples won’t be finished until 2070! There are plans for nine buildings in total, one being living quarters for monks so it will be a working temple. He has ‘disciples’ and they make and paint the temple and there is a whole factory. It is all made by hand and our guide said that Chalermchai Kositpiat likes to take his disciples from bad ways of life (alcoholism etc) and rehabilitate them. The temple is really easy to relate to as there is a half circle which is earth and then the hell (all men only one woman, her fingernail is red), with people’s arms stretching up. Then you walk through the teeth of hell into heaven. Inside the temple, over the doorway you have just come through is a giant skull (painted much like a day of the dead skull) with George Bush and Osama bin Laden in its two eyes. Then the walls around show people on clouds floating to heaven and then there is a giant Buddha statue at the back (in the traditional place, same as the other temples I’ve seen). You couldn’t take pictures inside the temple but the artist uses popular icons in the mural to repent good and evil. Like superman, the yellow minions, Darth vadar etc it is really awesome. I love the little bits of glass everywhere, they are really shiny and colourful, perfect for this sunny land. The bridge proclaims that the way to happiness is by foregoing temptation, greed, and desire. After crossing the bridge, the visitor arrives at the ‘gate of heaven’, guarded by two creatures representing Death and Rahu, who decides the fate of the dead. The main building is called the ‘Ubosot’ which features elements from classic Thai architecture such as the three-tiered roof and Naga serpents. I also bought a metal leaf (30 baht) and wrote my name on it, they get hung on these trees (see pictures) and then moved to the ceiling part when it gets full. We also visited the art gallery and I bought the book (100baht) because it had pictures of some of the stuff you were not allowed to photograph. We then had to move on in time to catch the train back to Bangkok. It was a lovely sleeper train with wide seats like benches and they unfolded really neatly into beds. Everyone when to bed almost straight away which surprised us. I guess they just wanted to get there and it was a novelty to us. Pictures below (stolen from another group member). We played cards until about 10pm. When we wake up we should be in Bangkok the next day! Next up: days ten and eleven. Previously: days six and seven and pictures from my elephant trip. 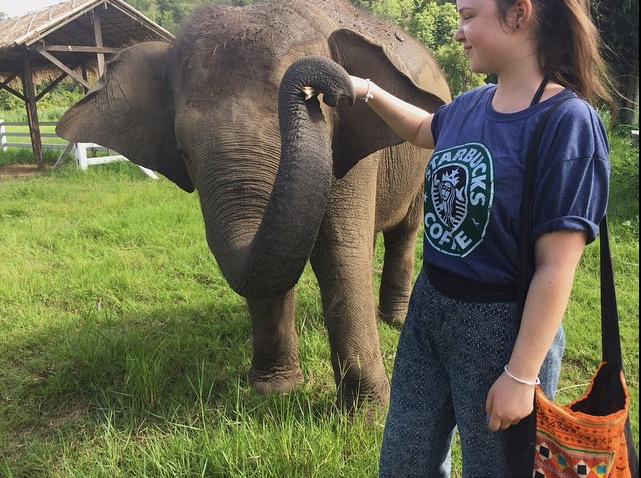 A follow up on the elephant trip mentioned in the last post. After discovering that the CD we paid for didn’t work I called Ran-tong elephant centre and requested another CD. The lady asked me to email her and a few hours later she had emailed me all the pictures. Here are a few. Next up: days eight and nine. Previously: days six and seven. Here are a couple more days. Catching up, soon we will be in the present. Today was a free day in Chiang Mai. Some our group opted for ‘The flight of the Gibbon’ which is a zipline through the jungle. The night before I had a look in some of the tour offices and there were several others like it with different names that were cheaper but I had already decided not to do this as I did a zipline in America. I expected everyone to have left but in the morning I ended up meeting three others for breakfast at a local cafe. 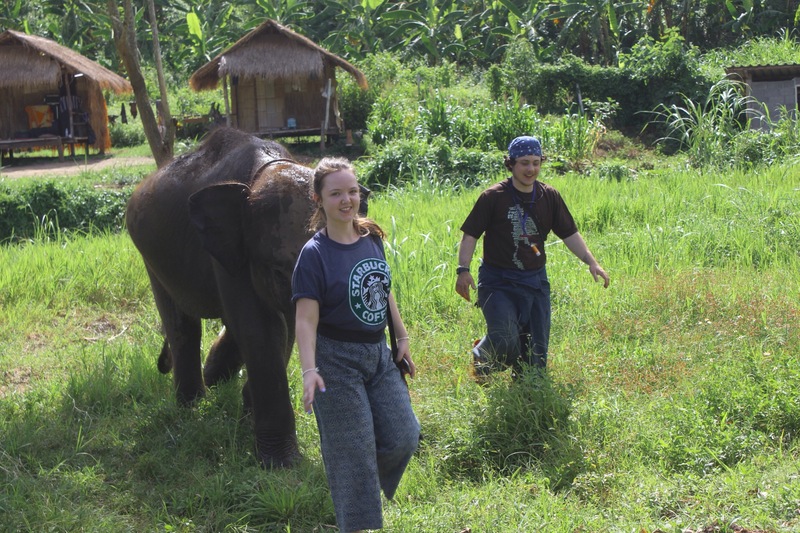 Me and a girl from our group (Katie) wanted to see some more elephants but it was difficult and I can’t decide if this was an ethical choice or not. Afterwards I felt a bit guilty as there is no way to prove that they don’t beat the elephants when you are not there. 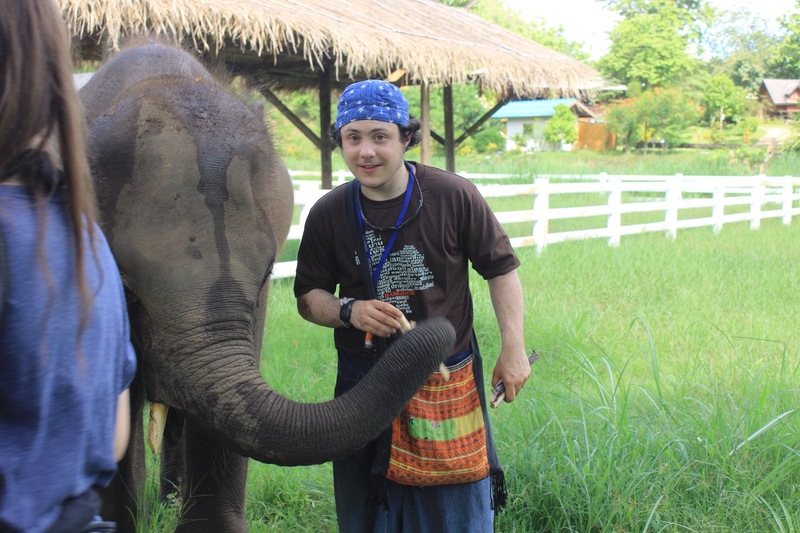 We booked at a tour office, again no one spoke English, they put us on the phone to the Rantong Elephant Rescue Centre. We then spent the morning wandering round Chiang Mai and had an early lunch at a random restaurant down a side road. I had banana samosas with honey which were delicious. The bus picked us up at 1.30pm and drove us to a hotel where we paid the balance of the trip and then sat us in the lobby to wait for a bus to take us to the elephant place. Interestingly a guy, (another backpacker on the bus) was deaf and used his iPhone to type a message to us and ask why we were waiting etc and I explained. I spoke directly to his face as I assumed (correctly) that he could lip read. I am now really pleased that I watched a series called ‘Switched at birth’ which is actually about two girls who were switched but features a large deaf community, most of the characters are deaf and it is in ASL. Although it was a soap I think it was done as an awareness program for America, and the message was not to treat them differently and a lot of the characters used their phones to communicate in this way. Anyway back to elephants. 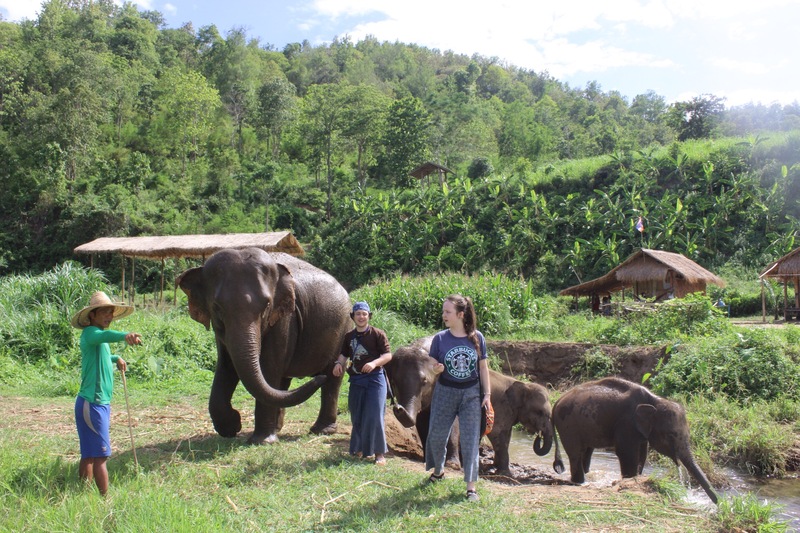 We had requested not to ride them so we were separated from the rest of the group and taken to feed and play with three young elephants ages 2-5 and a pregnant mother. They offered us a change of clothes and we took the trousers but we already brought messy t-shirts with us. 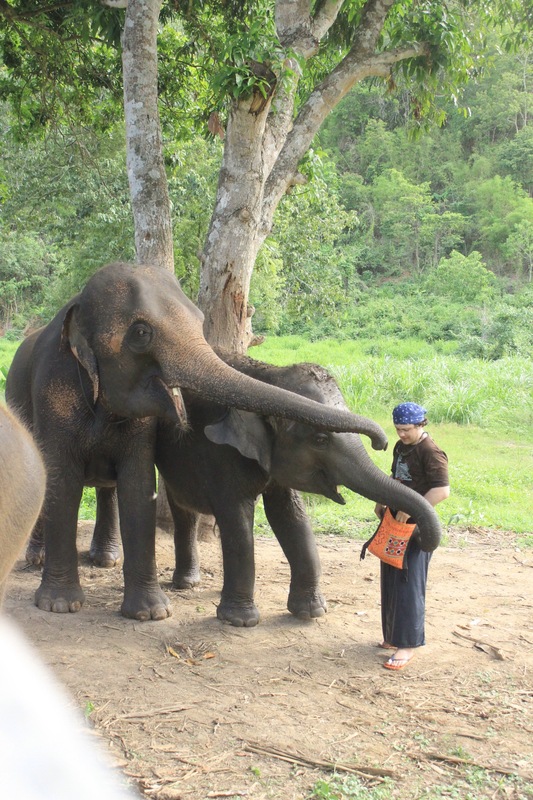 They filled little shoulder bags with sugar cane that we fed the elephants with and walked around with them. Now I was going to put pictures here (the guy took lots of us and sent them on a DVD to our hotel but I can’t get it to work so I’m going to call them tomorrow and ask for a new copy). Here is one I stole from Katie, she took a couple on her phone. We also went in a large pool with them and washed them. I am still very unsure as to their treatment. They responded very well to commands, in Thai I assume: come, sit, no, etc and I think the training for that must involve punishment? 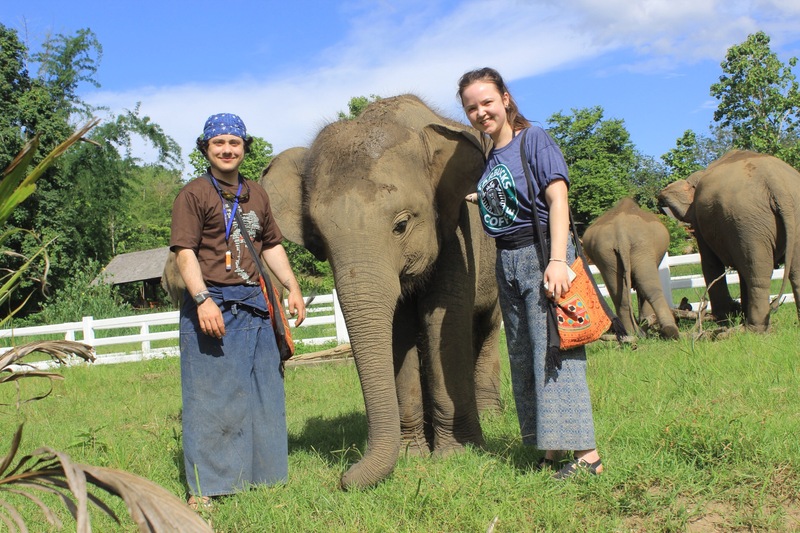 Other than that, they were not chained and allowed to roam around a largish grassy field which was better than the elephant hospital. 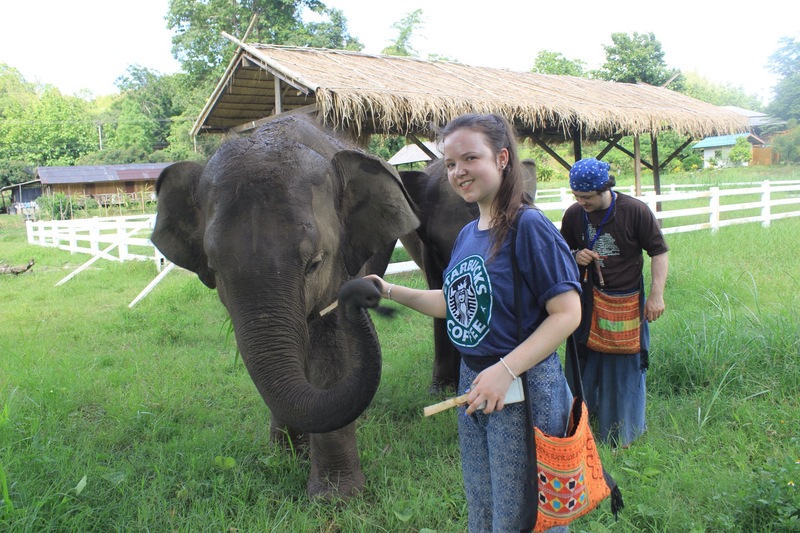 I spoke to an international volunteer from the USA, (there was a group on site) and she said the elephants are trained by private owners and loggers and then ‘rescued’ and bought by this place. So I can only hope they are treated better where they are now than with loggers, but they are all bred in captivity. 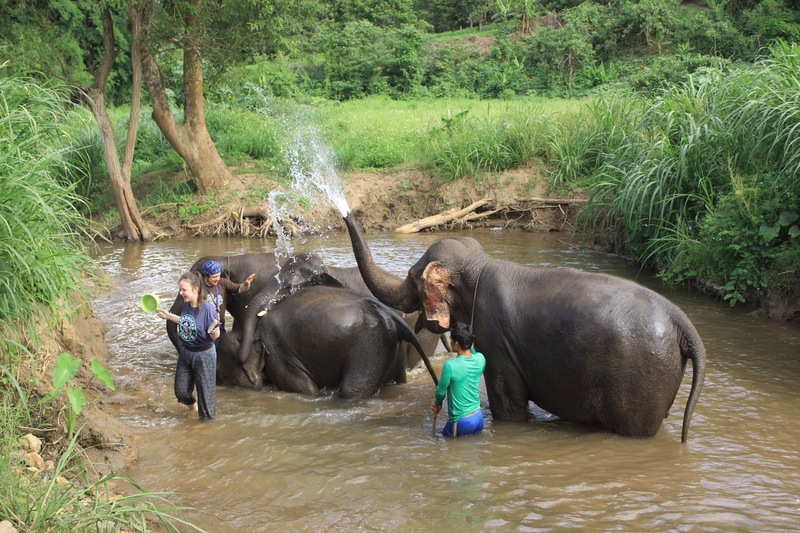 The trip included food so after the elephants we showered and then ate on a wooden deck before the bus came to take us back to Chiang Mai. We didn’t join the group for the evening meal as we had just eaten, but later Katie joined the group to see a ladyboy show and I went to meet Maren my German friend. We had dinner but it was about 11pm so it had been a few hours since I ate last. She told me about her trip and a jungle trek she did which sounded good. 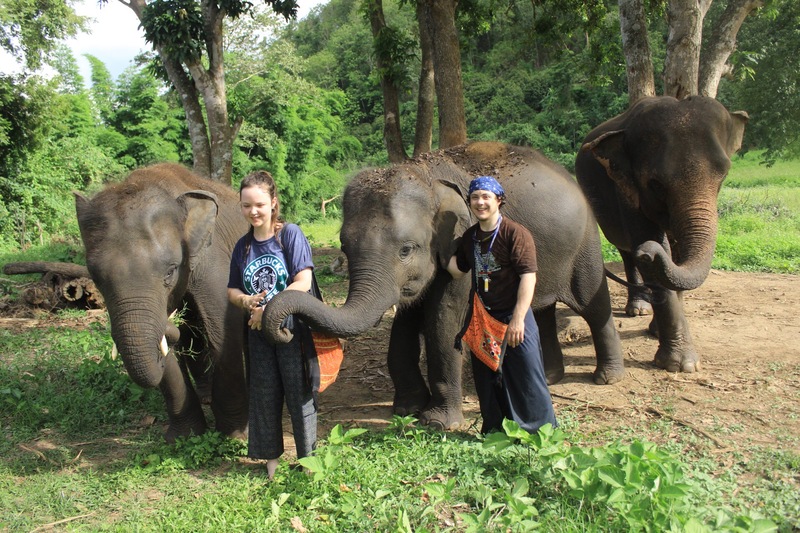 Picked up my DVD of elephant pictures from the hotel lobby and then packed to move on the next day. Checked out and left Chiang Mai at 7am. I ate breakfast, just some things I bought from 7-11. We drove to the bus station and then at 8am got onto a public bus, which is more like a coach and had air con. James our guide kept ‘warning’ us that the seats were really small as they were meant for Thai people but they were no different to at home. I don’t know how big he thinks our seats are?? We were given free water and snacks like before. Four hours drive later we changed to Songthaew for another hour. Stopped for lunch in Chiang Rai at a local cafe, (the floor near the toilet was tiled with broken pottery which is great upcycling). Drove onto a Chinese town/community in the area of Doi Mae Salong, reminiscent of a small southern Chinese village. Ladies (adult) and girls aged about seven tried to sell us bracelets. The price started at 20 baht but kept going up and up. Most of the girls from our group bought one and then they wouldn’t stop pestering us. There were lots of other stalls selling trinkets and food but their owners just sat there passively. Once we got back into the Songthaew one of the Chinese ladies followed us and kept slapping bracelets (mainly pink) down on the one Australian guy’s (Ryan) knee. It was so funny we were in stitches. Then we drove off to our accommodation further up in the hills/mountains. We were staying in a Chinese run guest house that was made up of lots of mini bungalows. After a shower a group of us went off to see a Buddhist temple on a hill. This involved climbing 719 steps but was really worth it for the view. On our way back through the town our guide bought us some lychees and other fruit to try. He bought a massive bag that would have cost a lot back home for about 50 baht (£1 GBP). As we walked back to our rooms before dinner we could hear music coming from the hills. We were not sure if it was live or not (probably coming from a bar) but it was very atmospheric. We ate in a local restaurant, where the menu was in Thai, Chinese and English. Several people had a ‘black chicken’ dish, and the chicken is literally black! Our guide also told us about preserved eggs that come in different colours like pink, green and black. After our meal we went off to a random karaoke bar. The sing-a-long lyrics were in Thai and sometimes in Thai but in the English alphabet. The bar was decorated in a Chinese style with lanterns (see pictures above) but still had a Buddha shrine and pictures of the royal family over the hearth which would have been out of place back home. You wouldn’t have Jesus’s cross on the mantelpiece in a pub. Most people went to bed, but me and the Scottish couple stayed in the hotel bar (closed) and played cards. 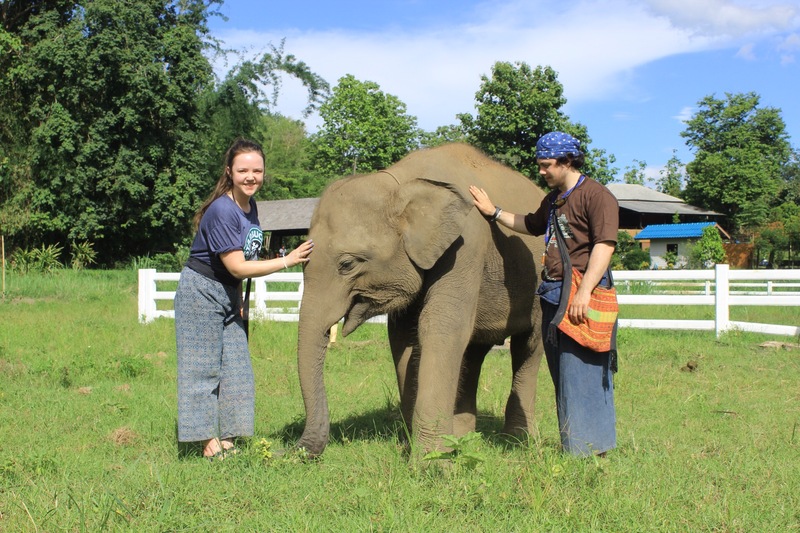 It was strangely quiet after Bangkok, with the exception of animal noises and the returning calls of what we think were frogs but are not sure. 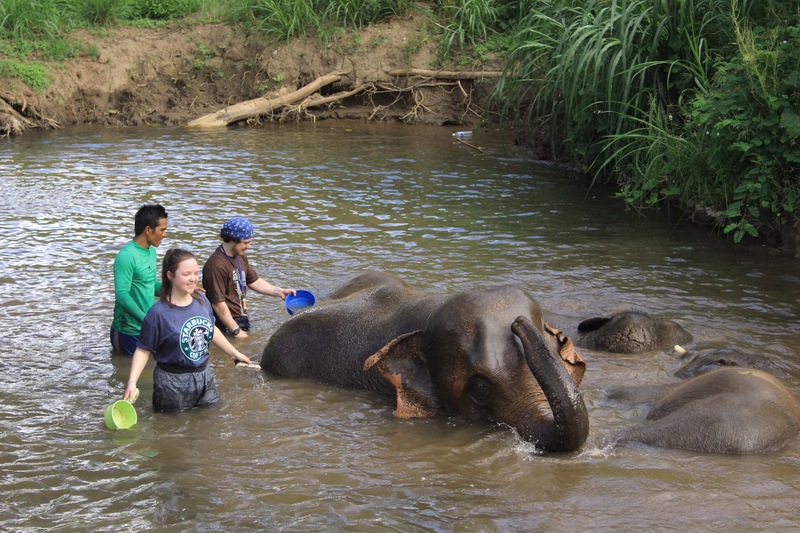 Next up: pictures from the elephant centre and days eight and nine. Previously: days four and five. Here are the next couple of days. The group I met last night consists of James our tour guide, native to Thailand and comes from Chiang Mai, an Australian couple, a Scottish couple from Glasgow and five girls one each from, Aberdeen, Birmingham, Italy, Portugal and Texas USA. So we have quite a multicultural group which is nice. Today is my first full day on my Geckos tour. We had a reasonably early start, checking out and leaving by 7am. I had to pay for my mini bar food. This was amusing to me as the same amount of snacks and drinks from a mini bar would cost over £15 GBP at home but it only came to 200 baht (£4 GBP approx). We took an air con van to the bus station, had to pay three baht to use the toilet (six pence in GBP). We then got on a public long distance bus to Sukhothai, where we were provided with complimentary water and snacks. I read one of two books that I bought in Koi San Road the night before. We stopped for a break half way and were given a voucher for a small lunch that was included in the bus ticket. We were on the bus for a very long 6 1/2 hours. When we finally arrived we only had 5 mins to drop our stuff in our room and then meet in the lobby for the cycling tour. We took a Songthaew (song-taile) taxi to the bike hire shop. It was a very similar set up to how I hired bikes in Africa and I think I would try and do it again during my time here in Asia. I had to get them to pump the tires up which was a bit of a struggle, luckily we had our guide to translate. One thing I have constantly been surprised about is how often a Thai working in tourism doesn’t speak any English. Now I definitely think that the English (and native English speaking people) are guilty of not learning a second language. Partly because there is no drive to do so but also because it is so badly taught in schools. But I would have thought that if you have ended up working in a hotel or tour place over here one of the reasons would be because you speak English? Or maybe they are mostly family run. Anyway, we adjusted our helmets and set off cycling to the Ramkhamhaeng National Museum. Where our guide taught us more about the Buddha and showed us round. There were some really interesting looking statues but the museum air con wasn’t working and it was just too hot and I was eager to get cycling and we were all tired after the long drive so we didn’t really make the most of it. We left the museum and me and another person requested a stop at 7-11 after the museum as we were starving. 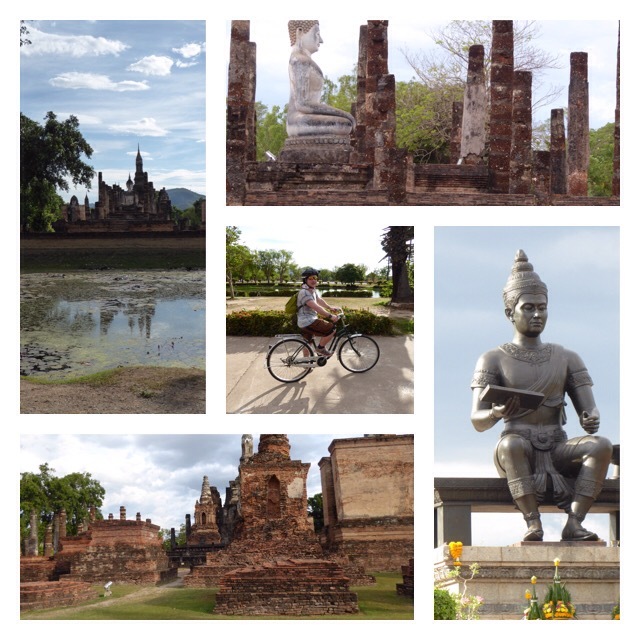 We cycled on to the Sukhothai National Park and saw the King Ramkhamhaeng Monument, the Wat Mahathat temple ruin, Wat Si Sawai and Wat Tra Rhang Ngoen. Also a few walking Buddha’s and other statues. Here are some pictures of the National Park. I filled my Water-to-Go bottle (which has been fab so far, I will review it soon), from the stagnant water in one of the pond/mini-lakes in the park. It was very green but came back out of the filter beautifully clear. 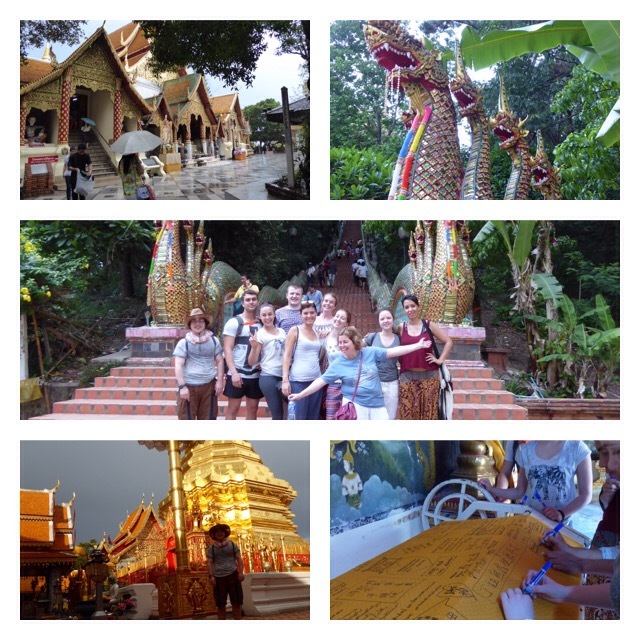 Finally we saw an elephant themed temple, Wat Sorasak and had our first group photo. After returning the bikes and having a shower at the hotel, we met at 8pm for dinner. James took us to a semi-outdoor restaurant (made from scaffolding poles and tarpaulins). Like last night, this was a locals hangout. My meal and drink cost a grand total of 45 baht which is approx £1 GBP! This place made Bangkok seem expensive in comparison. Then we had a wander round the small night market, and had smoothies and pancakes for pudding. James had a birds nest drink which is made from real birds nest! Apparently it is an expensive delicacy in Thailand at 8,000 baht per kg! It is also very popular with the Chinese. Another prompt start in the morning, checking out and leaving at 7am (although I was a few minutes late :/). We took a couple of air con vans to a nearby place (a small guesthouse), to have breakfast. There was a great menu with foods from around the world. I ordered a vegetable omelette and a milkshake. The food was fantastic when it finally arrived (maybe it was extra tasty because we were so hungry) but it took ages…. The Thai way is not to rush and everything comes out when it is ready and not in any order. The drinks don’t come out first either which is what I’m used to. It’s different to home because if your drinks haven’t arrived in England by the time your food arrives then the drinks have normally been forgotten or missed off the order. Another long drive in the air con van to Chiang Mai, via Lampang where there the Friends of the Asian Elephant Hospital is based. Geckos tours are big on responsible tourism and this hospital is supposed to to be ethically well run. However the animals were all in chains and in tiny pens, it was really sad and they were all nodding their heads which is a recognised sign of boredom. 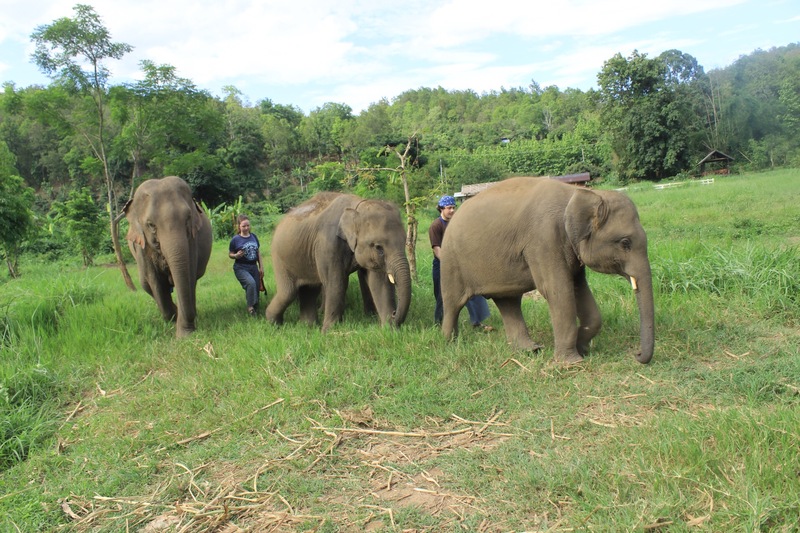 A few had a half lost legs to land mines (of course not the hospital fault) and had sterile bandages around the stump, in those cases we would understand why they were chained but the others were orphaned babies and otherwise healthy but still chained. Also there was very little in English, I think it would benefit them to have a sign or guidebook in English so we could learn more about the work they do. We then ate lunch next door at a separate the establishment called the Elephant Conservation Centre. This is no longer visited by Geckos as they make the elephants do tricks and they chain both their legs together. However the fact that we ate there means we did contribute to the running costs of the place which possibly defeats the objective of not using them? 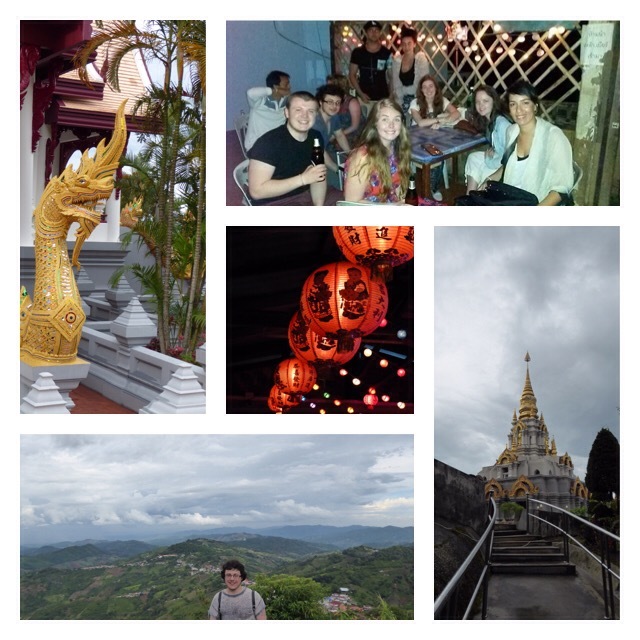 On our arrival to our hotel in Chiang Mai we had a quick shower and headed out again to visit Phrathat Doi Suthep temple which is a beautiful gold with terracotta tiles. It took a good 40 mins to get there in a Songthaew. 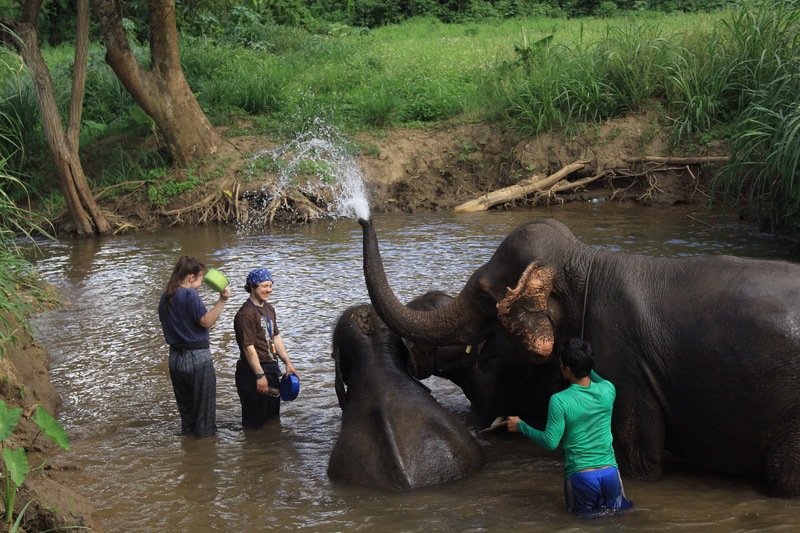 When we arrived there was a short burst of much welcomed rain, my first in Thailand. We saw some monks praying and tried the numbered Chinese fortune sticks which you shake out of pot onto the ground and then read your fortune off a slip with the corresponding number. We had string tied round our wrists that have been blessed by a monk. We all had to kneel down in front of a monk and he blessed us and then tied string round our wrists one by one, right hand for men and left for women. We also wrote our names on a piece of gold cloth which I think the monks will wrap round a Buddha image in the the next ceremony but it wasn’t clear. James our guide talked us through the story of the Buddha using the mural that runs all the way round the temple. 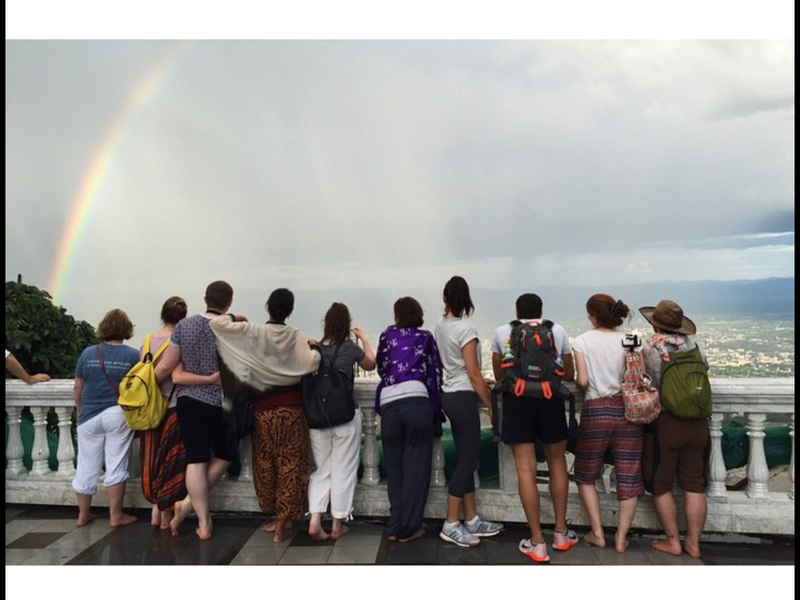 We saw a double rainbow and got a great group picture underneath it. We ate in another local restaurant and spent some time in the night market in Chaing Mai. Here are some pictures of the temple. Next up: days six and seven. Previously: days two and three.